The trails in this system are in Dead Horse Ranch State Park and in the Coconino National Forest. Trail users, the Dead Horse Ranch Trails Coalition, Arizona State Parks rangers and volunteers, and the Forest Service work together to manage and maintain the trails to provide an excellent experience in the park. Bring extra water and get an early start in the summer months. Trailheads are located north of the lagoon area or at the end of Flycatcher Road. Dead Horse Trail System: A non-motorized 20+ mile shared-use mix of doubletrack and singletrack. Four trailheads throughout the park lead up to the high desert of Coconino National Forest. The Lime Kiln Trail leg follows a portion of the historic Lime Kiln Wagon Road. Hikers and equestrians are encouraged to travel counter-clockwise on the the basic loop — Lime Kiln, Thumper, and Raptor Trails. Mountain bikers usually find that starting at the Roadrunner trailhead and riding the loop clockwise is more fun. For most cyclists, the trail is rated intermediate to expert. The Lime Kiln Trail follows a portion of the historic Lime Kiln Wagon Road from Cottonwood to Sedona. Learn more about Lime Kiln Trail and learn more about Share the Trail. Click here for a complete map of the trails at the park. Forest Loop: A 0.5-mile loop. Shared-use. Circles around and through a diversely forested area and provides river access by way of short narrow side trails. Starts and ends in the River Day Use Area. Canopy: A 0.25 mile ADA accessible trail looping under a Freemont Cottonwood tree canopy giving park visitors with limited mobility an opportunity to get off the beaten path. Excellent for bird watching and wildlife viewing. Starts and ends in the River Day Use Area. Mesa: A 1-mile interpretive loop trail. Circles the top of the hill west of the Red-Tail Hawk Campground and provides scenic views of Mingus Mountain, the Verde Valley, and Dead Horse Ranch. The trailhead is located on the west side of Roadrunner Road south of Red-Tail Hawk Campground loop. Tavasci Marsh: A 1-mile trail. Shared-use. The trailhead is located at the end of Flycatcher Road. Quail Wash: A 0.25-mile trail. Hike, bike. Stairs and bridges prevent equestrian use. Plant diversity and flowing water in the wash make this trail popular. Intersects with Hickey Ditch Trail. The trailhead is located at the south end of the West Lagoon parking lot. Hickey Ditch: A 0.5-mile trail. Shared-use. Follow along the historic Hickey irrigation ditch through a canopy of willow, netleaf hackberry, Arizona black walnut, & mesquite trees. Intersects with Quail Wash Trail. The trailhead is located at north end of the West Lagoon parking lot. Creosote: A 0.5-mile shortcut. Shared-use. Intersects with Hickey Ditch and Quail Wash Trails. Lagoons: One accessible loop around each lagoon. West Lagoon 0.39 miles; Middle Lagoon 0.41 miles; East Lagoon 0.72 miles. Hike, bike. Accessed from any of the lagoon parking lots, these trails allow you to stroll around the lagoons. We do request that horses not be taken around lagoon banks. Verde River Greenway: A 2-mile shared-use trail along the river. The trail weaves through some of the best nesting habitat in the area, a bird watchers' paradise. Intersects with Quail Wash and Lagoon Trails. The trailhead is located in the River Day Use area or can be accessed on the south side of the lagoons. Riverfront: A 0.5-mile trail. Shared-use. 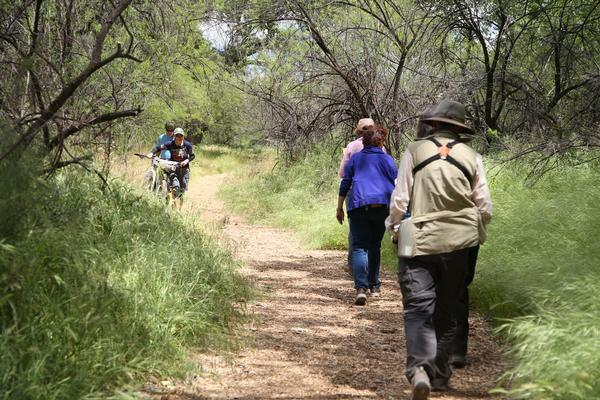 The trail runs along the south side of the Verde River and is good for walking. Trail is accessed from either the south end of the Dead Horse Ranch State Park Bridge or from Riverfront Park. Equestrian Trails: Many of the Dead Horse Ranch trails are shared-use. There are one-hour and two-hour guided trail rides available on the park. The rides take in the Verde River Greenway and provide scenic views of the lagoons, the Verde River and Dead Horse Ranch. The votes are in! The Lime Kiln Trail connecting Dead Horse Ranch State Park and Red Rock State Park won the 2012 Critic’s Choice Award for Best Bike Ride! For the sixth year, AZCentral.com experts have picked their favorite people, places, businesses, and things to do! Learn more about Arizona's extensive hiking trail network and plan a trip to experience even more adventure wihin the Grand Canyon state! The story of the park's name begins with the Ireys family, who came to Arizona from Minnesota looking for a ranch to buy in the late 1940s. At one of the ranches they discovered a large dead horse lying by the road. After two days of viewing ranches, Dad Ireys asked the kids which ranch they liked the best. The kids said, “the one with the dead horse, dad!” The Ireys family chose the name Dead Horse Ranch and later, in 1973, when Arizona State Parks acquired the park, the Ireys made retaining the name a condition of sale.